Founded in 1989, IDBS is a leading drug discovery software solutions company. IDBS’ expertise in biology and chemistry data management provides solutions for the life sciences industry. IDBS Software products provide low risk, high value management solutions for all aspects of research. It enables discovery organisations to capture, analyse, store and share research data. Effective customer support is high on the company’s business goals, with scientists at more than 200 of the leading discovery research companies globally, including the world’s top twenty pharmaceutical and biotechnology companies, using IDBS’ flagship product, ActivityBase. To deliver effective product support, the IDBS Customer Support team invested in Hornbill’s Supportworks as its service management solution. Since the deployment of the solution, the IT team has seen measurable efficiencies in both support costs and resource savings. IDBS has been able to respond to an increase in the volume of requests following product releases with the same amount of staff, a significant cost saving as previously these spikes in activity had required two extra full time support staff. 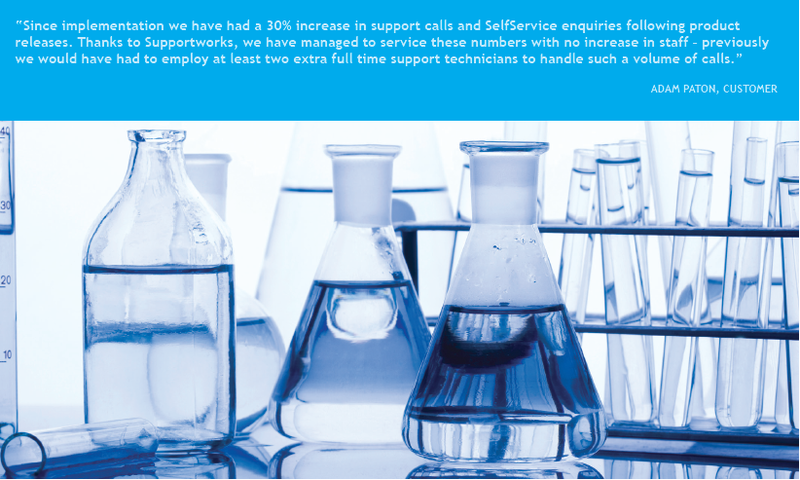 The SelfService element was a key business driver for IDBS in their selection of Supportworks. Previously, customers were able to access self help via the corporate website, a disjointed solution. IDBS believe that the success of the SelfService portal is down to the quality of information that is available. The Customer Support team has populated the Supportworks knowledgebase with frequently asked questions and information. It has over 1100 articles and documents since implementing the system, adding over 50 new items per month. 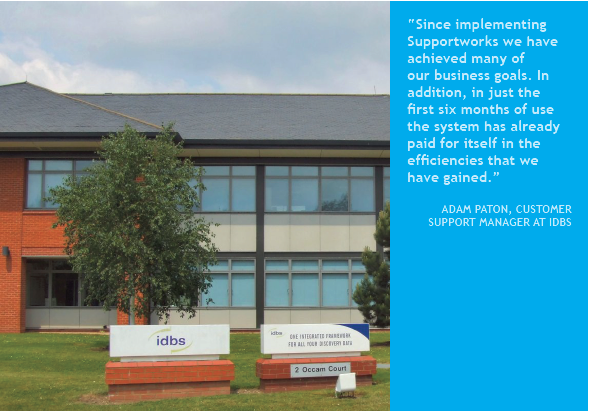 The feedback from IDBS’ customers has been very positive – the customer SelfService portal enables them to access support at any time of the day or night and often is able to resolve their issue. Another key factor in the success of Supportworks has been the integration of email with the call logging systems. The workflow processes ensure that calls are logged and tracked automatically. The processes that Supportworks has enabled IDBS to integrate have cut down on administration time, saving at least half a man-day a week just on handling emails. The lifecycle of calls – logging, allocating and closing – has been streamlined and saves time because it is integrated. Another benefit from implementing Supportworks has been the improved data collection on problems within the central database. The development team is able to use the data to review software issues and bugs. In the past the data collected was inconsistently recorded. This has also improved communications between the internal support team and development team. Following the success of the implementation, IDBS has also been able to provide support to customers of its ‘off the shelf’ standalone software product, as well as its enterprise solution. The Customer Support team has purchased a separate Supportworks licence to create a SelfService site that supports customers of the software.